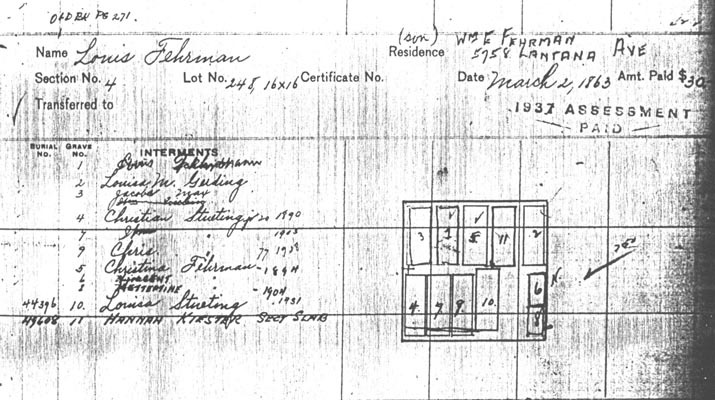 Louis Fehrmann purchased a plot at Vine Street Cemetery in 1863. Below are two images from the records of Vine Street. The first is a handwritten version, the second is typed and was done some later than the first. Besides showing where Hannah Kiester and Christina Fehrmann are located, there's a mystery. In grave 1, it's difficult to read the name on the handwritten version as it looks like one name is written on top of another, though it does appear that "Fehrmann" was written there. On the typed version, the name is Wm Schmidt.